Another couple asked to switch one of our off days, which resulted in us having 3 consecutive days off one week. So we took advantage of the extended time off to go visit our friends Tom and Ellen in West Yellowstone, Montana. We had an excellent time (despite not being able to do too much with my foot) and were able to get together with our former co-workers at Madison Crossing from last summer. Tom and Ellen had everyone over for a nice dinner, and Makena was on her best behavior helping Tom in the kitchen of their 5th wheel! The food was delicious, and it was great to catch up with everyone! Diane, our former co-worker, had everyone over for a campfire at her house. It was an enjoyable evening, meeting new friends, and catching up with our old friends. It’s one of the best things about this RV lifestyle! It was a quick, but enjoyable 3 days, and we hope to do it again so we can get together and do some hiking in Yellowstone, Montana, or Idaho. On our way back home, we decided to take the scenic route through Idaho, and come over the Teton Pass, across the mountains. Since Idaho is famous for potatoes, and potatoes are the main ingredient in vodka, it would only make sense to stop in at the Grand Teton Distillery in Driggs, Idaho on our way back! We did a short tour of their facility, and sampled a few of their spirits. We both agreed their regular vodka, was excellent. Probably the best we have ever tasted. Their other spirits were ‘okay’. The Teton Pass through the mountains is a beautiful drive (as long as you are not towing a 5th wheel, which we were not!). It has 10% road grades, and many people that work in the city of Jackson, drive this pass everyday. Housing prices in Jackson are crazy expensive, so many folks live in Idaho, and have a long, but scenic, daily commute. I would not want to drive this every day. Many times, the pass closes in winter due to storms. It snowed here on July 11! The locals said that made summer officially 21 days this year! It’s hard to believe that we have been here two months. Time has really flown by! Being in such a peaceful setting, with very pleasant weather, is good for the soul. Since school has let out, the 14 cabins have been at 100% occupancy almost every night. Work has been very busy, but we have managed to get out and do some fun activities. My particular job duties have changed slightly, as I am now in the office 3 days a week, and 2 days in housekeeping. These new duties started before I broke a bone in my foot, not as a result of the injury. The office work is a split shift, from 8am – 12pm, and then back again from 3pm – 7pm. However, from 12 – 3pm, I still am responsible for answering the telephone, assisting guests that have locked themselves out of their cabin (seems to happen at least once a week), or guests arriving before the 3pm check-in time. When the owners, Brad and Joanne, put in the 5 RV sites behind the cabins for the work campers, they also put in telephone lines. So I have a regular land line telephone in the RV to answer calls from 12 – 3pm. Because of the unusual hours, I now get a flat daily rate of pay, instead of an hourly rate. The office person is also responsible for cleaning the main lodge, daily cleaning of the BBQ grills, assisting housekeeping on busy days, watering flowers, and emptying the quarters from the coin-operated washer and dryers. The job keeps me busy, and I really enjoy interacting with the guests when they check in, and helping them plan their trips to the Grand Teton and Yellowstone National Parks. To give an overview about what this work camping job entails, I will refer you to a post that Karen wrote in June of 2014, her first summer here at Luton’s Teton Cabins, in which she went into great detail on the job duties. click here to read the post. Needless to say, the cabins are immaculate! I have cleaned more ovens this summer, than I have in my entire life! We have a good crew of work campers, and the nine of us all went to the Bar J Chuckwagon dinner and show one night. Brad and Joanne, upon hearing that we were all going out together, surprised us by paying for everyone’s tickets. We all had a great time at the Chuckwagon show. We had been to two chuckwagon’s in the Black Hills of South Dakota, but this one was far and away the best one we have been to. The show and the food were awesome! On the way down to Jackson, we were amused to spot this sign by the road…! Those of you that have been following the blog for a while know that we like to visit craft breweries (always good to support the local businesses! ), so we made a trip down to the Snake River Brewery in Jackson on our day off. It is Wyoming’s oldest brewery (started in 1994), and they have a not very catchy slogan “our river runs through your liver”. We did the sampler tasting of their beers, and deemed them to be “okay”. On the way back “home”, we stopped by Mormon Row in the park to view the structures that still remain from the early settlers to this area. Location, location, location! Grizzly, Moose and Eagles…oh my! 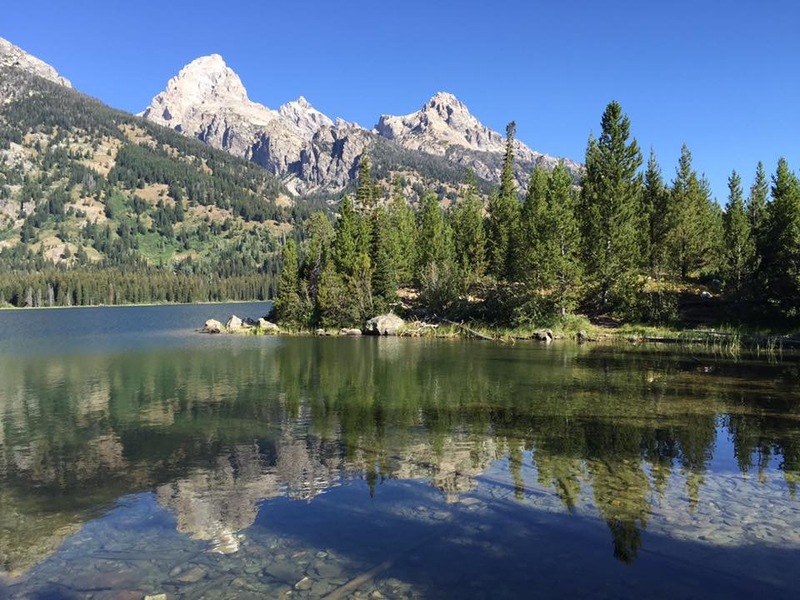 Before I broke a bone in my foot, we did manage to get in two small hikes in Grand Teton National Park. And we were rewarded with plenty of wildlife sightings! Before we even got into the park, Karen and Al spotted this Osprey in a tree. For our first hike, we went to Hermitage Point Trailhead in Coulter Bay, and opted for the short 3.5 mile hike around Heron Pond and Swan Lake. It was a relatively easy hike, with beautiful views of the Tetons (actually, there is no bad view of the Tetons!). We had some nice views of Mt Moran, which contains what is called the “skillet glacier”, but the locals refer to it as Jimmy Hendrix’s guitar glacier, based on the shape. The more I stared at it, I started to see a profile of a face (might be the high altitude!). Karen, Al and Dan quickly spotted a Bald Eagle in a tree, and it must have taken me 5 minutes before I could see it. Karen was able to get a nice photograph of the Eagle. We also saw a few sandhill cranes, ducks and geese on this hike. Later that night we went on another short trip down by Shwabachers Landing, and found a very active beaver in the water, along with evidence of his recent tree trunk trimming. The next day we went on another hike with our co-worker Jane, and literally ran into a fox crossing our path. Fortunately, he/she ignored us, but it did startle us. We also spotted a coyote off in the distance. Make sure you pull over, because something exciting is lurking nearby! The park rangers did an excellent job at keeping traffic moving, and keeping the tourists from getting too close. After I broke my foot, I was relegated to looking for wildlife from the car, and not on a hike. Fortunately, I was finally able to cross ‘bull moose’ off my bucket list of animals to see in the wild. This young man’s antlers are just starting to grow, and still have the velvet on them. Again, Karen had her nice camera with her, and got some excellent photos (Dan’s worried this will cost us money, as I have been looking at new cameras online!). But the photo I was most surprised with (and one I took!) was of the bee that popped into the picture I was taking of a flower. I really didn’t notice the bee until I was looking at my photos later on. We hope everyone has a safe and happy Fourth of July!